Constitution Day in the U.S., a day that celebrates the signing of our Constitution by 39 delegates on September 17, 1787, at the close of the Constitutional Convention in Philadelphia's Constitution Hall. How much do you know about our Constitution? Have you ever read it? If not, you definitely need to take the time today, on Constitution Day, to do so. If you're not familiar with the rights it gives you, how will you know when they're being infringed? There are a number of current issues whose constitutionality is being debated. If you don't know what the Constitution says, how can you join the conversation? Several high-profile politicians have recently confused the Constitution with the Declaration of Independence. How embarrassing, for them and for us! How can our Congressional representatives support and defend our Constitution (as their oath requires), if they don't even know what it says?! How can they know if the legislation they are proposing and debating contradicts the principles it holds? When I was in school (no, it wasn't quite the Dark Ages), we studied our nation's founding documents and their history and meaning. Did you? How about your children? Are those topics being taught in today's schools? Shouldn't they be? How can you be an American without knowing what basic fundamental rights are guaranteed to you by our Constitution? The original Constitution is handwritten, on 4 pages. 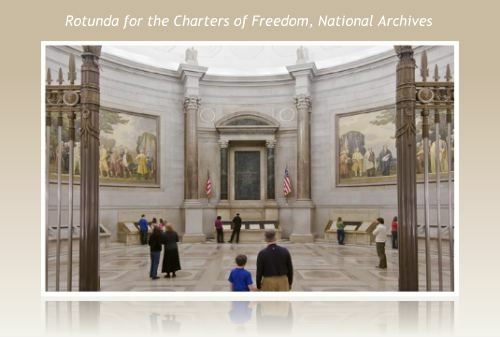 It is housed in the National Archives in Washington, D.C., in the Rotunda for the Charters of Freedom, along with the Declaration of Independence and the Bill of Rights. 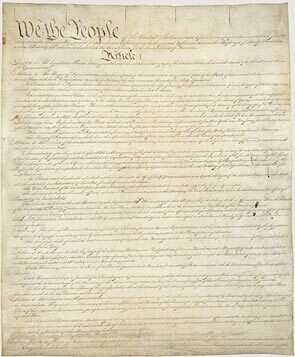 "We, the People of the United States, in Order to form a more perfect Union, establish Justice, insure domestic Tranquility, provide for the common defence [note the British spelling], promote the general Welfare, and secure the Blessings of Liberty to ourselves and our Posterity, do ordain and establish this Constitution for the United States of America." The seven Articles set forth how the government is structured and how the Constitution itself can be changed. It specifically enumerates the powers of the federal government and its various branches. Article II, Section 1 sets forth the eligibility requirements for our President, which have been the subject of public debate in the past couple of years with questions raised about the eligibility of Barack Obama. a resident within the United States for fourteen years. And finally, there are the Amendments, changes that have been made since the original document was signed. To date, there 27 Amendments. When the Constitution was ratified in 1789, many people were concerned that it did not protect certain freedoms, which they believed fundamental enough that they should be included in Constitutional protections. So on December 15, 1791, the first 10 Amendments were added. They guarantee certain rights and freedoms to the people of the United States, and are commonly known as the Bill of Rights. First Amendment: Freedom of religion (notice that's not freedom FROM religion), freedom of speech, freedom of the press, and the right to peaceful assembly. "Congress shall make no law respecting an establishment of religion, or prohibiting the free exercise thereof,or abridging the freedom of speech, or of the press, or the right of the people peaceably to assemble, and to petition the Government for a redress of grievances." Second Amendment: The right to bear arms. Third Amendment: The right of the people to not have soldiers quartered in their homes without their consent. Fourth Amendment: Freedom from unreasonable searches and seizures. Fifth Amendment: Protection against double jeopardy, right against self-incrimination, and right to due process. Sixth Amendment: Right to speedy and public trial, right to counsel, and right to confront the accuser. Seventh Amendment: Right to trial by jury. Eighth Amendment: Protection against cruel and unusual punishment and excessive bail and fines. Ninth Amendment: Enumeration of rights in the Constitution shall not be construed to deny others retained by the people. Tenth Amendment: Powers not delegated to the United States by the Constitution, nor prohibited by it to the States, are reserved to the States respectively, or to the people. This part is very important, and today is being breached egregiously. It specifically says that the federal government has ONLY those powers granted to it by the Constitution, and no more. ALL OTHER RIGHTS are reserved to the States, or to the people. That takeover of General Motors, and firing of its executives? The President and the Congress had no authority whatsoever to do that, and yet they did. Why aren't more people objecting that our Constitution, the supreme law of our land, is being ignored? The health care bill? Again, Congress has absolutely no authority to require you to purchase insurance. Yet they passed the law, over the objection of roughly 80% of the American people. How could that happen? It isn't supposed to be possible. Our Constitution is being trampled. There is even considerable doubt that the man occupying the White House does not meet the three simple requirements of the Constitution to hold the office of President. How can a man who may not be Constitutionally qualified be exercising the powers of our President? And why isn't all of America outraged that our Constitution is being ignored?! I suspect it is because our rights and freedoms are not properly understood and appreciated by many Americans. You see, these rights and privileges and freedoms have always existed in these United States. There has never been a time when they weren't there, from the beginning of this nation. So many people take them for granted, assuming they will always be there. The men and women serving in the Armed Forces of the United States of America understand how precious our freedom is. They've seen lands where things that we consider even the most basic rights and freedoms are non-existent. They also understand the terrible price of protecting and defending that freedom. We urge you, on this Constitution Day, to learn what our Constitution says, and make a commitment to stand up and speak out to defend and protect it alongside them. For if you are unwilling to stand up and speak out, this once great nation may well find itself in the situation President Reagan described, explaining what life was once like in the United States, when we were free. Notice that oath does not say "while I am on active duty." Every officer I know believes this to be a lifetime commitment, and a lifelong duty, to support and defend our Constitution against anyone who does not honor it. On this Constitution Day, I ask you to join them, and make your own personal commitment to learn what our Constitution says, and to stand up and speak out against anyone who fails to honor its principles and respect it as the supreme law of this land. For if you will not, our Constitution is not worth the paper it is printed on. Our military is made up of only one percent of our population. It requires the commitment of the other ninety-nine percent of us to also be vigilant and adamant about protecting our Constitution, for without it, we lose those freedoms which are uniquely American. We cannot let that happen. The prospect is unthinkable.